In 1934 he worked actively for the Democratic campaign of Upton Sinclair for Governor of California. F. He also examined the relationship between physical and emotional love explored various unorthodox family structures and speculated on the influence of space travel on human cultural practices. In his fiction Heinlein coined words that have become part of the English language including "grok" and "waldo" and popularized the terms "TANSTAAFL" and space marine. 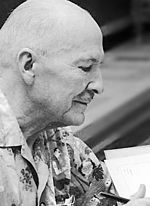 Heinlein was named the first Science Fiction Writers Grand Master in 1974. He also examined the relationship between physical and emotional love explored various unorthodox family structures and speculated on the influence of space travel on human cultural practices.